Diehards Line: Kittle said he injured his rib on the third play of the victory over Oakland on Nov. 1. He caught four passes for 108 yards and a touchdown in that game, including a one-handed, catch-and-run. “I thought it was going to hurt much more than it did,” Kittle said, via David Lombardi of TheAthletic.com. That means, as Matt Barrows of TheAthletic.com points out, that 793 of Kittle’s yards came after the injury. That production already had the attention of fantasy owners. The toughness is an added bonus. Diehards Line:In restricted action, Drake has averaged 4.7 yards per rush over the first three years of his career. If he had enough carries to qualify, Drake would be tied for second with Ezekiel Elliott and Adrian Peterson among active running backs in that category. Only Jamaal Charles has done better when touching the football. “I’ve been able to stay healthy, take care of my body,” Drake said. “With a new coaching staff coming in here, it’s a clean slate. I can continue to build my repertoire for knowledge of football in general. So I’m definitely comfortable and confident in the position I am. I have my routine down. ...” We'll be keeping an eye on this one in coming weeks. The Facts: Manning is in uncharted territory on his accomplished 15-year career, which includes two Super Bowl rings. The 38-year-old Manning is entering the final year of his contract, which pays a base salary of $11.5 million, and the Giants could actively seek an heir-apparent in the upcoming draft. Manning recognizes he could share the QB room with his eventual replacement, but he isn't fazed by the situation. "I figure the Giants are going to get a young quarterback," Manning told reporters Monday. "I understand that. I've got to do my job and I'll do my part. My job, as I see it, is to go out and play quarterback and win football games." Diehards Line: The Giants' decision makers have remained steadfast in their support of Manning for the immediate future. But the team has certainly gone about doing homework on three of the top quarterback draft prospects in the 2019 NFL Draft. New York recently hosted Oklahoma's Kyler Murray on a visit, had dinner with Dwayne Haskins the night before Ohio State's pro day and brought in Missouri's Drew Lock on a pre-draft visit.In the event the Giants elect to grab a quarterback sooner than later in the draft, Manning will find himself potentially pulling double duty. The first surrounds his desire to get the team wins, while the second will fall on acting as a mentor to his eventual replacement. The Facts: Cook has played 15 games since the Vikings made him the 41st overall choice in 2017. He has missed 17 games with injuries. The Vikings running back tore the anterior cruciate ligament in his left knee early in his rookie season. He missed five games with a hamstring injury last season. Now fully healthy, Cook is working on staying that way. “Get back to being me,” Cook said. “Everything’s back on schedule. No more rehab. It’s just great. Get bigger. Get stronger. Get faster. Learn the game more. Lead the group. And just be me." Diehards Line:Cook has 258 touches for 1,364 yards and six touchdowns in his two seasons. 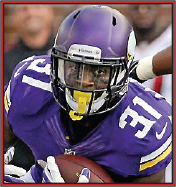 He and the Vikings are looking for more out of him this season, especially with Latavius Murray having signed with the Saints as a free agent. “He passed the torch down,” Cook said, “and now it’s time to run with it.” The hope here is, with Gary Kubiak on board as an offensive consultant, Cook will get every opportunity to run with it this fall. As long as he's healthy. The Facts: Watson's not rehabbing anything this offseason. Which means he can focus on getting better. The Texans’ third-year quarterback lost much of last year’s program to recovery from his torn ACL, and HC Bill O’Brien said he thinks having Watson on the field this offseason will make “a big difference” for the team. Diehards Line: “I don’t think [Watson] has a ceiling,” O’Brien said on The Adam Schefter Podcast. “I think that it’s hard to put a ceiling on a guy like that because of who he is, how he works, his ability, his skill set [and] his passion for the game. He has had, now this season, a whole offseason of no limitations and coming back to the offseason program, a full go, can do everything. Training camp, full go. Last year, that wasn’t the case. He was limited in training camp, limited in the offseason program, so now he’ll have a full offseason, which I think will be big.” Watson played through rib and lung problems last year, but didn’t miss a game. He was also sacked a league-high 62 times, and the Texans haven’t necessarily fixed that this offseason). But O’Brien thinks Watson can make strides in his own play after completing 68.3 percent of his passes for 4.165 yards last season. Having him able to work with his teammates is a great starting point for that. Diehards Line:As PFT notes, there’s little doubt that Jackson has the athletic talent to make big plays, but the Ravens need a more consistent offense than they had a year ago. The Ravens may run the ball more than any other team in 2019, but Jackson will have to be a better passer as well. He’s working on it. The Facts: Don’t waste the No. 10 overall draft pick on a quarterback. That was the not-so-underlying message Flacco sent to the Broncos’ Tuesday in a press conference following Day 1 of the team’s voluntary minicamp. “I don’t care whether they take a quarterback at 10 or whatnot," Flacco said after his first-ever practice as a Broncos’ starting QB. “The only thing I care about is I want this team to be as good as they can with me at quarterback. So if they feel as a team as an organization we can add value to our team with the 10th pick, then I’m all for getting the guy who can add value to the team with me as the understood quarterback." Diehards Line: In other words, get a player who can contribute Day 1. A quarterback would be fine if he was acquired in, say, the fourth round of the draft. But first round? Flacco isn't looking for a repeat of last year. The Ravens traded back into the first round of the 2018 draft to take athletic quarterback Lamar Jackson with the No. 32 pick. Flacco wasn’t benched for Jackson so much as he injured his right hip in game 9. Jackson came in and the Ravens started winning. When Flacco was healthy enough to play the final month, the Ravens stuck with Jackson. That was then. Flacco is a hired gun for the Broncos now. “I want to get this team to be the best it is with me at quarterback," Flacco said before admitting that who the Broncos draft is not something he controls. But we know where he stands. 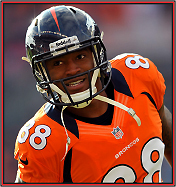 The Facts: According to multiple reports, Thomas has agreed to a deal with the former Broncos and Texans wideout. Ian Rapoport of NFL Media reports it is a one-year deal worth up to $6 million. Diehards Line:The move will reunite Thomas with his first NFL head coach as Patriots OC Josh McDaniels was in Denver when the Broncos selected Thomas in the first round of the 2010 draft. He’d go on to make five Pro Bowls and win a Super Bowl with Denver before being traded to Houston in the middle of last season. ... As PFT reminded readers, Thomas tore his Achilles on Christmas Eve, which ended his season and led to his release earlier this year. He’ll have to get back to health before we’ll get much of an idea about his chances of making an impact on offense for the Patriots, but there will be opportunities in a receiver group that’s unsettled beyond Julian Edelman and Phillip Dorsett. Along those lines NFL Network's James Palmer reports that Thomas is expected to be available sooner than most believe he will be. It's possible the Patriots are aware of this. The Facts: Following up on a previous item. ... HC Doug Marrone says RB Leonard Fournette will not face any team discipline for his arrest last week for driving with a suspended license. Diehards Line: Marrone called it a mistake and said he was arrested for a similar offense when he was an assistant coach at Georgia Tech. So Fournette has that going for him. But at some point, he needs to start meeting expectations on the field. Until then, these off-field issues are going to continue to dominate the discussion surrounding him.